Joe Calzaghe is looking forward to watching Anthony Joshua perform Saturday night in what’s considered Calzaghe’s home stadium. The Welsh legend will reflect fondly on his own huge fight at Principality Stadium when he attends Joshua’s heavyweight title fight against Carlos Takam on Saturday night in Cardiff, Wales. That’s the venue, then known as Millennium Stadium, where the retired Calzaghe won his super middleweight title unification fight against Denmark’s Mikkel Kessler in November 2007. Calzaghe also has been thinking about another fight – Joshua against Tyson Fury – and how huge it would be for British boxing. The 29-year-old Fury wants to fight again, but the British Boxing Board of Control still hasn’t granted the Manchester native a boxing license. The former heavyweight champion battled alcoholism, cocaine addiction and depression after he upset Wladimir Klitschko to win the IBF, IBO, WBA and WBO titles in November 2015. Fury (25-0, 18 KOs) never participated in the twice-scheduled rematch he owed Klitschko. He eventually sought treatment and gave up his titles. The 6-feet-9 Fury has gained a lot of weight since he last boxed, but has repeatedly said he is committed to a comeback. During Fury’s hiatus, the 28-year-old Joshua (19-0, 19 KOs) has become the United Kingdom’s biggest boxing star. A crowd of over 75,000 is expected to pack Principality Stadium for the Watford, England native’s fight against Cameroon’s Takam (35-3-1, 27 KOs), a late replacement for IBF mandatory challenger Kubrat Pulev (25-1, 13 KOs). Fury’s inactivity has shifted focus toward an eventual showdown between Joshua and WBC champion Deontay Wilder (38-0, 37 KOs), but Calzaghe thinks the skillful Fury would give Joshua a tougher time than the hard-hitting Wilder. “Deontay Wilder, I think Tyson Fury would be a tougher fight for Joshua, just because of the way he boxes,” Calzaghe said. 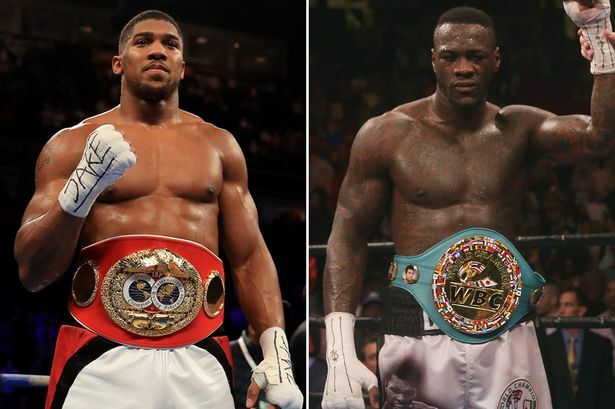 “I fancy AJ to knock out Wilder, but it will be pretty entertaining while it lasts. 40Cal is a great fighter. But Fury wouldn't and won't be a tough fight for Joshua or Wilder. [QUOTE=BodiesInFlight;18163473]The Americans won't like this opinion Joe. :nono:[/QUOTE] And the Brits won't like Keith Thurmans either, lol. Calzaghe has always been a joke who fought bums. Good joke by joke calslappy.